Two special medical brands of infant formula were found to have selenium content lower than claimed on the package, leading stocks to be recalled and an investigation to commence. Two batches of Nestle infant formula produced in the Netherlands and sold by Nestle's Shanghai dealer were found to have lower selenium content than their packages indicated, and the Shanghai dealer is being investigated, the city's food watchdog said today. The Alfare lactoprotein deep hydrolysis formulas for special medical purposes were found to have a selenium amount 37.4 percent and 33.7 percent lower than that marked on their package label, which stated 0.7 micrograms per 100 kilojoules, the China Food and Drug Administration found. The formulas were imported by Shanghai Nestle Product Service Co Ltd and sold at two maternal and infant shops in Shenyang, Liaoning Province, according to the administration, which ordered the Shanghai Food and Drug Administration to investigate. Selenium is an essential trace element for humans, and it is important in the enhancement of immunity and the prevention of cancer, the national administration said. The amount of selenium for infant formulas with special medical purposes should range between 0.48 micrograms and 1.9 micrograms per 100 kilojoules, and the minimum amount of selenium should not be lower than 80 percent of that marked on the package, China’s relevant standards ruled. 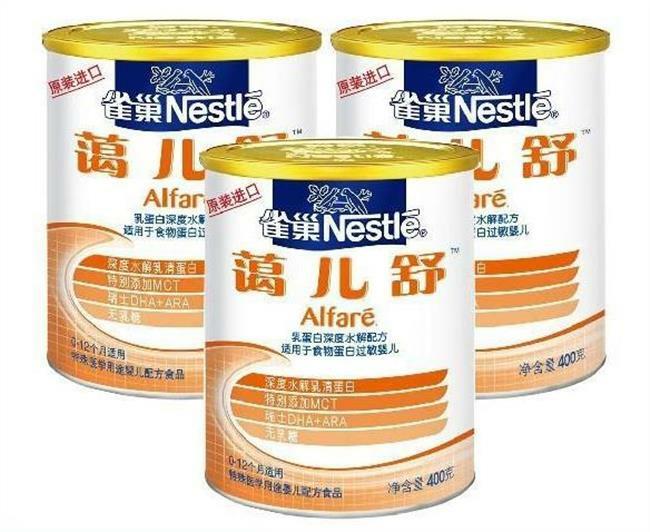 The Pudong New Area Market Supervision and Management Bureau found that Shanghai Nestle Product Service Co Ltd purchased 10,290 tins and 9,888 tins of the two formulas respectively, and 10,265 tins and 9,878 tins have been sold. So far a total of 135 tins from both batches have been recalled, and the unsold products have been removed from shelves and sealed, according to the bureau.